Square has a bad wrap. The rigid, even shape becoming analogous with those who are uncultured, safe and un-hip. But when it comes to the watch world — square is the exception. With round watches ruling the market, square watches have the creative space to be bold and embrace their imposing shape. I mean — when was the last time you saw a square watch and didn’t instantly have an opinion? Exactly. This watch shape breaks the mold (quite literally), grabbing our attention and evoking serious emotions as our eyes inspect its sharp corners. So, we’re here to challenge you to ask yourself why you’ve never really considered a square watch. With a wide variety of sharp, masculine and modern square choices — it might just be the piece that you’ve always been looking for. Here are a few luxury watch brands that fit the bill. Tag Heuer has produced a square watch that has been capturing hearts and wrists since its introduction. Let’s get this out of the way first. When you envision a square watch, you probably automatically think of a vintage Monaco — maybe with a shiny alligator band, stainless body and that signature blue face. This watch has been given a serious facelift in recent years, though, embracing not only modern design but modern materials. The Bamford model isn’t your fathers Monaco, kids (although, if you’re into that, you can find Steve McQueen styled Monacos, too). 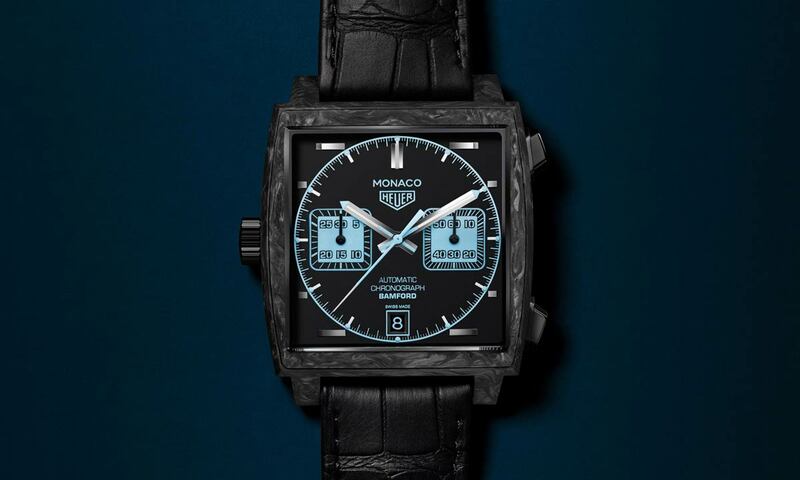 But the Bramford Tag Heuer is a breed all its own. You’d think the black dial and bright aqua blue chronograph counters would be the highlight, but the black-marbled carbon case is what gives this square watch a sharp, masculine look made for the modern man. Flip it over and you can peer through the steel and sapphire caseback to peer at the Swiss, 30mm Calibre 11 movement inside boasting a 40-hour power reserve. It’s like they couldn’t help themselves, though, and decided to pair this extremly modern watch with a traditional alligator strap But we don’t mind it — at least it’s been given this wonderful matte finish. 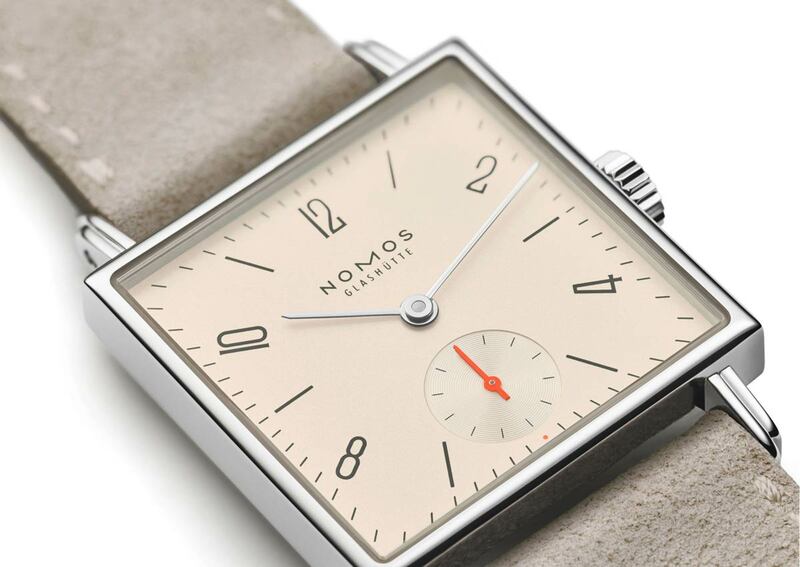 Square watches feel inherently vintage, so for the stainless steel Tetra 27, NOMOS decided to lean into it. The German watchmaker is world-renowned for their modern designs featuring clean typography that’s simplicity evokes a feeling of a simpler time. Together with the thin, angular case of the Tetra, NOMOS was able to create a timepiece that, with a champagne face and leather band, nods to the past while clean numerals and an orange second hand add just a touch of contemporary flare. Making it all the more modern, the design is unisex. Not only does it appeal to men and women but it’ll look great on both wrists — sitting a bit smaller on a man’s wrist and making just enough of a statement on a woman’s. Inside is a modern Glashütte Alpha mechanism ticking with 17 jewlels and a sizeable 43-hour power reserve. A handsome watch with impeccable craftsmanship and an affordable price — the Tetra is kind of the ‘it’ modern square watch at the moment. 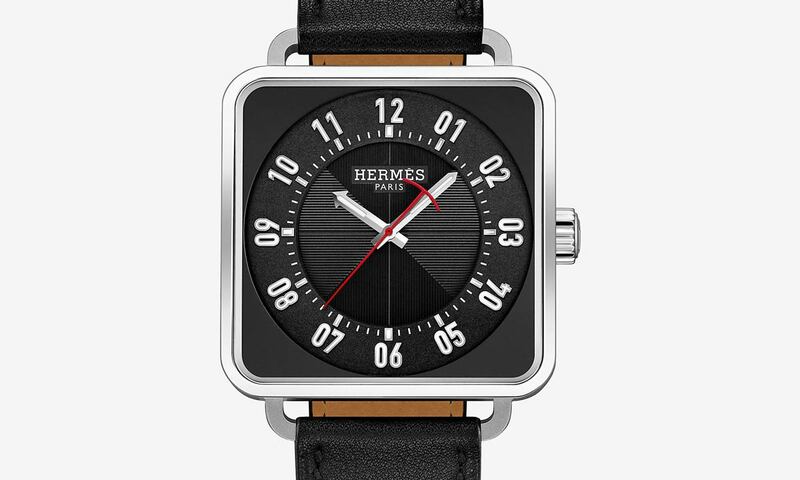 Hermes might be a historic, sober, luxury brand — but this watch is a real modern standout. Designed in collaboration with Marc Berthier back in 2010, the watch has been given an even more modern facelift this year that has watch collectors and fans of the brand equally excited. Now, there are two models to choose from — the jet black model featuring a bright red second hand or the gray featuring an eye-catching yellow second hand. Both have bold white Arabic numerals circling the dial and a cross-hatch guilloché in the center which plays with the light and adds some dynamism to this otherwise clean face. And while the stainless 38mm case sits boldly on the wrist, the rounded edges soften the look and make it feel approachable. By no means is this watch understated, but being Hermes, it has a classic touch that feels inherently timeless, too. So, what do you think of these modern square watches? Are you ready to be square?